A lush, green lawn gives you a sense of pride and boosts your home's curb appeal. 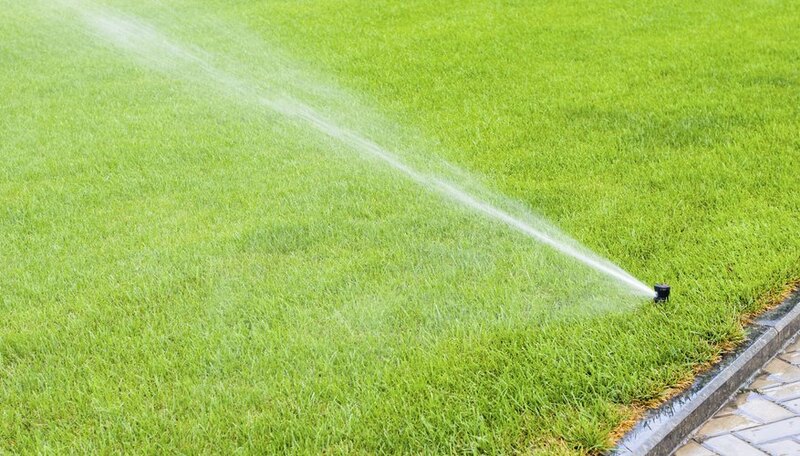 Grass needs enough water to grow properly and stay green, but the timing and method of irrigation is also a factor in how well your lawn grows. The average lawn does well on about 1 inch of water each week. That includes both rain and any extra irrigation you do to keep your lawn green. Use a rain gauge to help you determine when you need to pull out the sprinkler to supplement the rainfall. If your rain gauge shows 1/2 inch of rain during the week, you'll need to give your lawn another 1/2 inch of water. Use an empty can placed on or near the lawn to figure out how long you need to run the sprinkler. Let the sprinkler run for 15 minutes. Measure the water in the can. Multiply that number by 4 to get the amount per hour. Use this as an estimate to help you figure out how long to run the sprinkler. For example, if your calculations show the sprinkler puts out 2 inches per hour and you need 1/2 inch to supplement the rainfall, you need to run the sprinkler for about 15 minutes. Lawns generally grow best when they receive deep watering at less frequent intervals. Water the lawn once per week to reach the recommended 1-inch total -- unless it starts looking dried out or in need of water sooner. If you water several times throughout the week in smaller amounts, the roots of the grass become shallow to reach the moisture. Deep grass roots are stronger and better able to handle periods of drought. A thorough watering should moisten the soil to about 4 to 6 inches deep. Watering once a week makes lawn care simple, but you can also decide how often to irrigate your lawn based on how it looks. Use some simple tests so you don't need to worry about how much rainfall you received. Watch for signs that the grass needs more water, such as the blades wilting or folding, or taking on a bluish-gray tone. Take a walk across the lawn to check irrigation needs. If your footprints stay in the grass, irrigate the lawn. Grass blades with enough water in them spring back after you step on them. Hard soil is another sign that the lawn needs water. If you can't easily press a screwdriver into the soil and the grass shows other signs of drought stress, pull out the sprinkler. It's best to irrigate infrequently, but that doesn't mean overloading the lawn with all of the water at once. If the lawn can't absorb the water fast enough, you'll lose moisture through runoff or create messy puddles in the grass. Clay soils, in particular, may have a slower absorption rate than sandy soil that drains quickly. Shut off the sprinkler for a short period so the water has a chance to soak into the soil. Turn the sprinkler back on to finish applying enough water to meet the lawn's needs.